LinkedIn is focused on connecting talent with opportunity at massive scale. Today, we’re proud to announce the upcoming LinkedIn Referral Engine (coming in 2011), which will connect companies with the best talent resource they have—the thousands or millions of people their employees already know. Employee referral programs are one of the most effective ways to hire and the leading candidate source by volume. Referral hires typically perform better, stay in their positions longer, and even cost less to hire. Be aware of open jobs. Hiring needs constantly change, and some companies have tens, hundreds, or even thousands of open positions. How can an employee help fill a job she doesn’t even know is open? Identify a good candidate. Most people think about only a fraction of their networks on a regular basis. How many talented professionals do employees overlook just because they aren’t top of mind? Know how to act quickly. Many referral processes are confusing or communicated inconsistently over time. What if it only took 2 clicks to refer someone? Recommends the best candidates for open jobs. Our powerful algorithm recommends the best candidates by looking at all your employees’ contacts through the lens of your open jobs. Employees then apply their own judgment to refer only the best of the best. Simplifies the referral process. 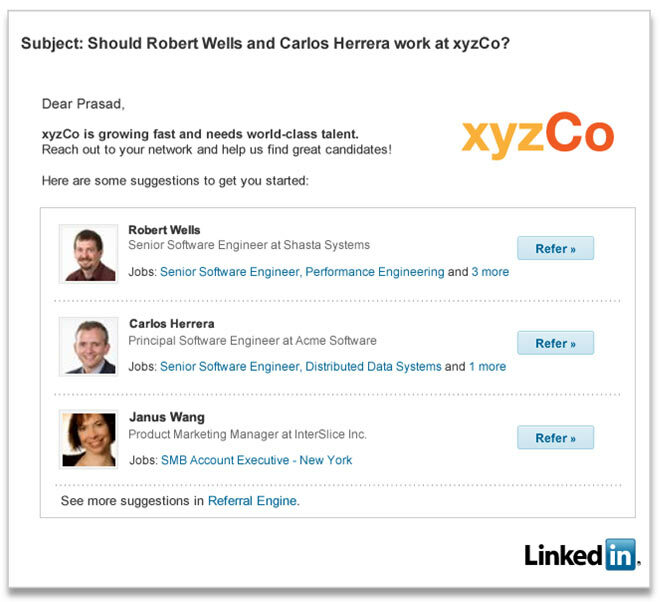 Recommendations are delivered right to your employees via email or the LinkedIn homepage, and they can contact a candidate or make a referral in just a few clicks. Keeps referrals top-of-mind. Periodic reminders with specific suggestions make sure employees are thinking about referrals consistently. Since many of your employees are already networking on LinkedIn, Referral Engine allows you to tap into thousands or millions of their connections instantly. Needless to say, we’re excited, and we look forward to sharing more about Referral Engine in the coming months! Learn more about LinkedIn's Referral Engine.